How do I keep my dog cool? Too much exercise on a hot day. Humidity reducing the effectiveness of panting. Muzzles - dogs can't pant as efficiently while wearing one. Age - like humans, elderly and younger dogs are less effective at regulating body temperature. Although some dogs are more susceptible to the effects of the sun, it's probably best to consider all of them as potentially at risk. Dogs only have sweat glands on their paw pads, so are unable to sweat in the same way as humans. They do lose heat through evaporation by panting. The tongue has a rich supply of blood vessels which dilate and cause the tongue to swell - by as much as six times when exercising. Panting moves air from the hot internal body core to the outside, and also increases the airflow over the increased surface area of the moist tongue, throat and windpipe. Panting, and the necessary increased salivation to keep the tongue and airways moist, leads to massive fluid loss which if not replaced can lead to dehydration. 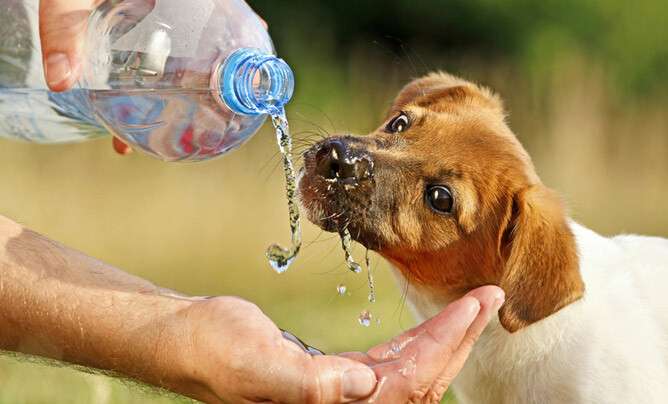 Dehydration can lead to heatstroke, so make sure your dog always has access to fresh drinking water - at home and away. Struggling to breathe, dark red gums and glassy eyes. The rise in body temperature may lead to cell death in the brain, seizures, coma and death. Prompt action once you notice any symptoms is vital. Move your dog away from the hot environment and into a cool, shaded area. Begin cooling him using lots of whatever you have to hand - shower, bath, hosepipe, bucket of water, sponges or wet towels to drape over him. If immersing your dog's whole body, keep his head supported above the water's surface. Use a sponge or towel to wet his face and cool his head - this will help reduce the risk of the brain overheating, and may help his breathing. Always use cool rather than icy water. Icy water can cause blood capillaries in the skin to contract, slowing the circulation and thereby slowing the cooling of the internal organs. If you can't fully immerse your dog in water, concentrate on the inside of the upper thighs where his back legs meet his body, his armpits, and the back of his head. Offer the dog small drinks of water - not too much at a time, as this may lead to vomiting or bloat. Around 10 minutes of cooling should be sufficient, after which immediately take your dog to the vet, even if he appears to be fully recovered - the effects of heatstroke can continue for up to three days. Prevention is always the best policy - a dog who survives heatstroke may sustain organ damage and could suffer lifelong heath problems as a result. Plug the small hole of a Kong with cream cheese or peanut butter, and then place it in a plastic cup or carton, with the large hole facing upwards. Fill with chicken, beef or lamb stock, leave to cool and then freeze. When it's frozen, give it to your dog, although it's best eaten outdoors. You could also stuff a Kong with canned food and freeze it. Make some doggy ice cream. Mash a banana with low or fat-free yogurt and add runny honey to taste. Pop it in the freezer - put a scoop in your dog's bowl as a special treat. Alternatively, spoon the unfrozen mixture into a Kong and then freeze it. Many dogs enjoy crunching ice cubes - for a bit of added interest, make up a batch flavoured with meat stock, or place a strawberry, raspberry or slice of banana into each compartment of an ice cube tray before filling with water and freezing. You could install air conditioning, but if this is too expensive an option, portable units can be bought more reasonably from DIY stores. Draw curtains and blinds. Leaving more than one window open encourages better air circulation. Don't leave your dog in a conservatory, as it may get very hot in there. Some dogs have no sun-sense whatsoever - keep an eye on your dog, and when you feel he's had enough encourage him to go indoors or somewhere cooler. Remember the danger of sunburn to any exposed pink skin - buy a dog-friendly high factor sunblock. If your dog has free access to the garden through a dog flap, bring him indoors and bolt the flap shut between 11am and 3pm when the sun is at its hottest. Open car windows - use expanding grilles to allow good ventilation while preventing the dog from sticking his whole head out, which could result in injuries. Buy a battery-operated crate fan. Ensure drinking water is available - a travelling bowl will prevent spillages. Water left in a parked car may heat up; if necessary replace it with fresh cool water before setting off again. Try to park in the shade so the car isn't too hot when you return. Windscreen shades help, plus sunshades can be used on side windows. Never leave your dog in the car - even on comparatively cool days when it's only 72oF outside, the temperature inside the car can rise to 116oF within an hour, even with the windows cracked open. In the enclosed space of a car, humidity builds up quickly and panting becomes less effective. Overcast days can be just as dangerous; hazy sunshine is still sufficient to send internal car temperatures soaring, and cloud cover can clear unexpectedly and rapidly. Leave your dog at home on really hot days - even if you have air conditioning and can keep the car interior cool, your dog will still have to cope with the heat outside at your destination. And if you get stuck in a traffic jam, or break down, it could turn into a nightmare. If your dog travels in a crate, place a heat-reflective sheet over the top to shade it. Keep an eye on him, as you may be much cooler in the front than he is at the very back of your car. If your dog has a digging pit, you could wet the sand so he can excavate a cool hole to lie in. You could buy him a paddling pool to splash in and out of - a rigid plastic children's clamshell sandpit/pool is ideal. He may like a cooler mat to lie on, or a special bandanna containing water-absorbing crystals so it stays wet and cool for longer - although you can use an ordinary one and keep wetting it. There are also heat reflective coats and jackets available with panels filled with water-absorbing crystals, or you can pop an ordinary doggy T-shirt on your dog and wet it with water. You could buy a garden pump-type sprayer, and spritz him with it from time to time - lift the coat hairs with your fingers as you do so, so the water reaches his skin. Don't take your dog out during the hottest parts of the day - walk when it's cooler in the early morning and later in the evening. Woodland walks tend to be cooler than open areas. Always carry a supply of drinking water and a portable bowl. Encourage your dog to take things steadily and not run around - don't throw toys, and if necessary put him on a lead. Swimming can be a fun way of cooling off. Don't let your dog overdo things, as it is strenuous exercise, and heed any warning signs. Stick to clear, shallow rivers where you can see the bottom (and therefore spot any hazards), and don't let him go in if you have any doubts as to water quality. If you can't find a safe swimming area, head for your nearest hydrotherapy pool instead.